I can see why blue is your fave, Mica...you look fab wearing blue dresses:) I love how you paired that red Avery with the second dress. Both of these blue dresses are great! And they look really nice with both the red and burgundy bags. I'd love to wear more blue but struggle with pairing it with blue jeans! A dress would be a great way to go since I don't have to worry about coordinating tops + bottoms! Yes, a dress is such a great alternative! I really like the mini-bags with your looks. They seem to fit your size and style nicely, whereas, if I carry a small bag, I feel like a dwarf it--ha! haha yes, benefit of being petite! On the other hand some bigger bags can swamp my short self! The dress is amazing. In Cologne, Germany (where I live) it's rainy and cold. I wish I could wear such a cool dress right now. Lovely one. I really like the compact sizes of these two handbags Mica, structured handbags have a way of adding so much stylish to an outfit! I hope you have a fabulous weekend!! They are such cute bags! Not only do you love blue but you sport it beautifully Mica - it brings out the color of your eyes. Blue is a wonderful color on you and both dresses look so fresh and summery. The bags you chose to pair with them are perfect. Happy weekend Mica! I love the heart pendant, I have a similar one that I feel like I haven't worn in ages. These necklaces look beautiful on you! You should definitely wear it again! This one is so fun to wear! I love the color combinations that you have going on here Mica! Especially that first one, I think the color of your bag works really well with that dress, I love it. Have a great weekend! I think your red bag looks gorgeous with that second dress! And the purple compliments your first dress perfectly too! I love how you choose 2 handbag colors that weren't in the actual dresses, but they look so nice! Hope you have a wonderful weekend! Blue suits you. Both of the dresses are lovely and the pop of color from the bag looks great with both dresses. I'm also amazed at how affordable the first dress is. It was such a bargain find! Those two handbags are adorable! You look great! Lovely dresses! Have a great weekend! 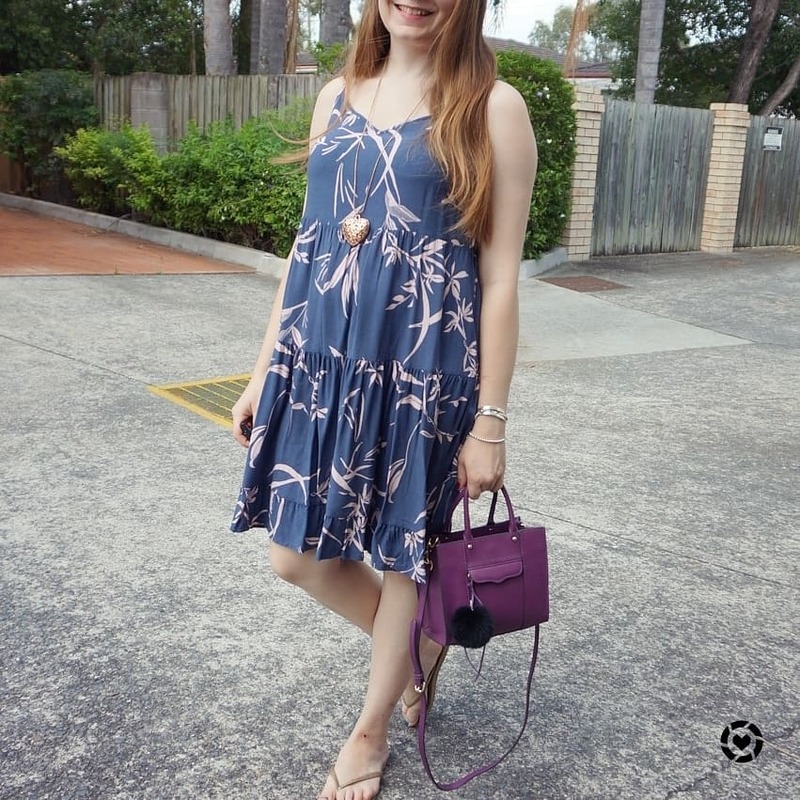 Yes, a printed dress is such a summer staple! I always loved the combo of blue and red (my two favourite colours), so I obviously love the second outfit. That red bag is so pretty. I'm not a bag lady, but I just love that one, it's so eye-catching and stylish. The first outfit is also beautiful. 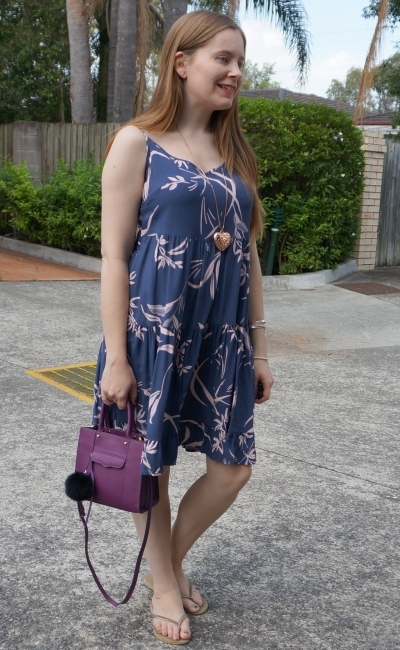 The combination of that blue pattern dress with a purple bag is a winning one. That dress does have some purple in it? Anyhow, it looks great with the bag. Both dresses are so lovely on you! I wish you a fantastic weekend. Thanks Ivana :) It is the cutest little red bag! The print on the dress is a pastel pink, although it might look a little lilac on your screen? Thank you for sharing and don’t miss my latest post about new revolutionary app BLOGGSY for Bloggers and Influencers LIKE ME AND YOU. Bloggsy is designed to allow us Bloggers and Influencers to increase our revenue making opportunities by providing a marketplace for us to promote 30 skills and services that we all should be sharing with each other. There’s a HUGE REFERRAL SCHEME too! Dresses are such a summer staple for me, especially for easy days. I usually don't bother with accessorizing them much though. So beautiful dresses! I love your red mini bag. Happy saturday! Oh, I'm so envious it's warm wear you live and you can wear pretty dresses! I love summer fashion. Your dresses are lovely! I liked the first dress more than the second one, but I loved the two bags. I loved the match of the first look. You're so beautiful in the first look. I love the sleeves on the second dress! So cute and unexpected! And the small RM bags give these dresses the perfect pop of color! Summer heatwave here in Australia, haha! Absolutely adore both dresses on you and gies to show that you don't have to spend lpts of $$$ for a gorgeous piece. You definitely don't! :) I have a lot of under $5 pieces in my wardrobe! Really cute outfits! You look amazing, hun! Both dresses are adorable and you look so pretty, Mica! The bags and dress pairings are super cute! I'm such a major slob, I live in Lululemon and I really need to get out of that comfort zone and try some new things! 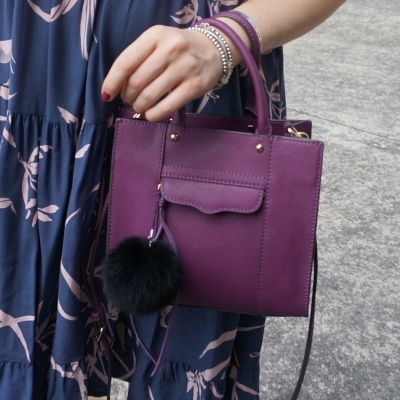 I especially love the blue dress with the purple bag! So adorable! Such a comfortable way to dress though! :) I just like the ease of a dress, throw on and you're done! It is really unbelievable you bought the first dress for only $ 2 - I still find it so beautiful and also this time you combined it perfectly. The second look together with the red is really my taste and you had a really good idea to combine red with this dress. Your parents are for sure absolutely proud of their beautiful, hard-working and intelligent daughter! Thanks Rena! The dress was such a bargain buy! Love the way the red and purple bags accent and pop your dresses! Such lovely styling!! Enjoy the sunny season! Blue is also a fav of mine ! Those mini bags are so cute! I'm so amazed how often you change you hand bags out. I carry the same one for month. Hope you have a great weekend. We got hit with a winter snow storm. Great outfits - you do look lovely in blue, Mica. I love that you accessorize your handbags. That little handbag is to die for! I need to add one to my collection. That's such a cute bag you got there dear! Both of these blue dresses are so pretty on you! 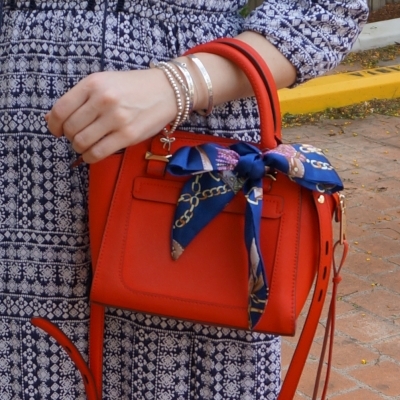 The red and burgundy bags are the perfect pop of color and I love how you accessorized both! Blue is my favorite color too, and both of these dresses look beautiful on you! 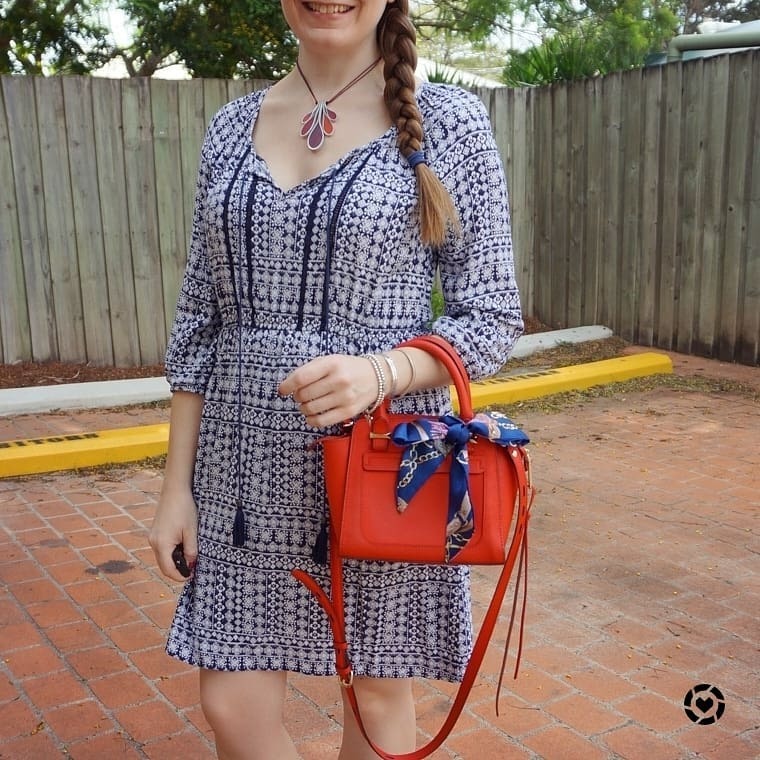 I love the pattern of the second dress and it looks great with the red purse. You always accessorize outfits so well! The bags are gorgeous Mica, and the dresses are very pretty.